USS San Diego ACR-6 (ex-USS California) about 1917. Officers are Adm. W.B. Caperton and his staff. U.S. Naval Historical Center Photograph # NH 83793. Part of the generation of smokeless-powder guns developed at the end of the Spanish American War and much stronger than the previous 8"/40 (20.3 cm) Mark 5. Used as secondaries on the last US pre-dreadnoughts and as main guns on armored cruisers. A number of older armored cruisers were rearmed with this gun during refits in the early 1900s. 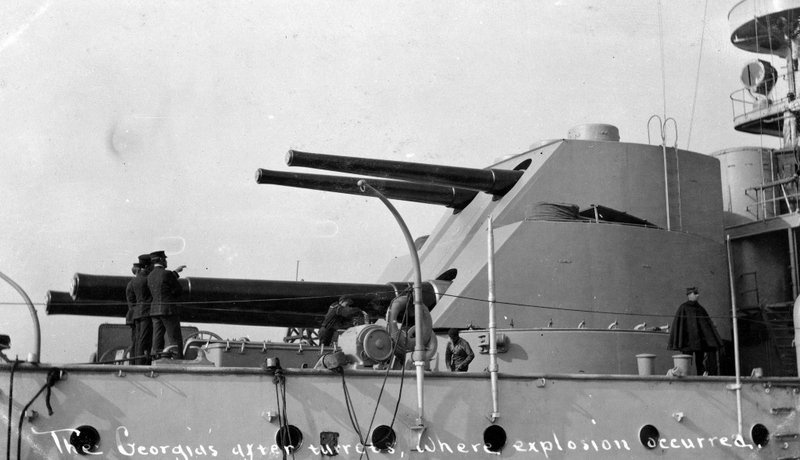 This weapon was unusual in that some pre-dreadnoughts used them in two-level turrets, with the 8" (20.3 cm) guns on top and a larger caliber below. Although ultimately unsuccessful in this configuration, the experience gained led to the very successful development of superfiring main-caliber turrets on USS South Carolina (B-26), the first "dreadnought" with this mounting scheme. The scrapping of pre-dreadnoughts as required by the Washington Naval Limitation Treaty made many of these guns surplus. About two dozen were reused as coastal artillery on Army mountings and given new, lighter and more streamlined projectiles. Constructed of A tube, jacket, four hoops, a locking ring and a liner, all of nickel steel with a Welin breech block. A total of eight Mods, 6/0 to 6/7, were used with the differences being in the liners, breech mechanisms, chambers and rifling. Firing was by both percussion and electrical means. During World War I, a "flat-nose" shell was developed for use against submarines. The flat nose allowed the projectile to travel through water with reasonable accuracy. Assuming an overall shell weight of 260 lbs. (118 kg), I would estimate that this shell had a burster of about 68 lbs. (31 kg). Naval mountings had a maximum elevation of +20 degrees. The above data is from "Ordnance Data Sheets" of 1905 for face-hardened Harvey plates and is for the older shell design. "U.S. Armored Cruisers: A Design and Operational History" reports that this same shell could penetrate 4.4" (112 mm) of Krupp nickel-chromium armor at 9,000 yards (8,230 m). The above data is from "Elements of US Naval Guns" of 1918 and is for the 7crh projectile. Data is corrected for angle of fall and may also refer to harder armor than used for the 1905 data. These turrets were balanced, which means that the center of rotation was also the center of weight. The Mark 12 used the "grass-hopper" counter recoil system whereby a spring box, located under the gun pit, was connected via two heavy, pivoted arms to the gun yoke. See 10"/40 (25.4 cm) datapage for a sketch. The Mark 12 was the first USN turret with an inclined glacis plate, an invention by Chief Constructor Philip Hichborn. The cylindrical turret used on previous ships had vertical sides, thus requiring large gunports in order to achieve even a limited elevation. 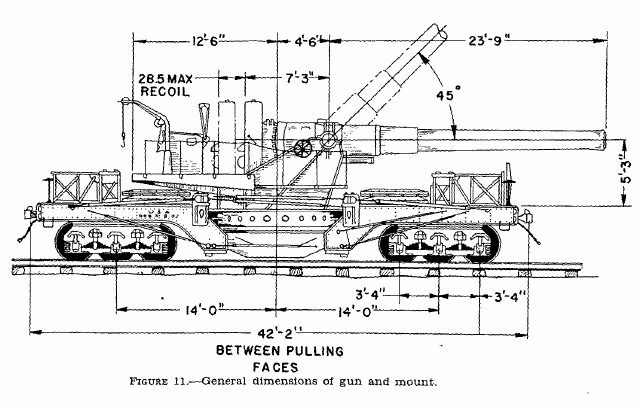 The inclined face of the Mark 12 meant that high elevations could be achieved with gun ports only slightly larger than the outside gun diameter, resulting in greatly improved protection. This basic design was so successful that the USN continued to use it for gun mounts and turrets until after World War II. Training, elevation, hoists and rammers were all electrically powered. It took 15 minutes to train the Mark 12 turrets through 270 degrees by hand while it took only 45 seconds to do the same job with electric motors. During modifications in 1905, New York had all six of her 8"/35 (20.3 cm) guns removed and was refitted with four 8"/45 Mark 6 guns in two Mark 12 turrets. The Pennsylvania class traded their four 8"/35 (20.3 cm) guns for four 8"/45 (20.3 cm) Mark 6 guns. Between 1907 and 1909 these turrets were extensively modified. Almost all electrical gear that could create sparks was moved from the turrets and ammunition spaces and placed into compartments below the armored deck. Electrical equipment that was absolutely required to remain was made flameproof. 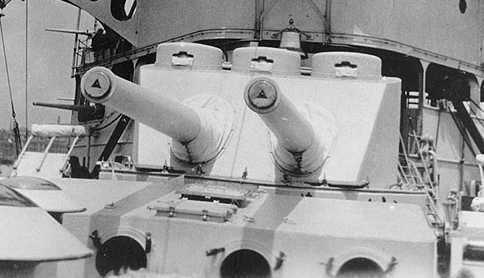 Automatic shutters were fitted in the ammunition supply tubes between the turret and magazines in order to increase flash protection. Longitudinal bulkheads were fitted to separate the guns into individual compartments. 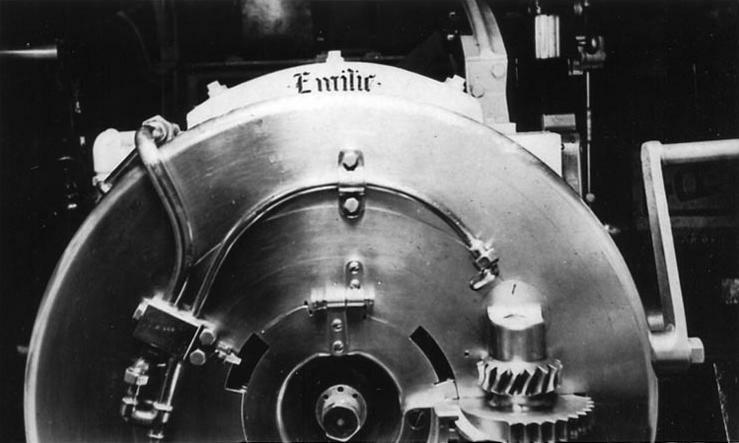 Electric powered ammunition hoists and rammers were removed and replaced with handworked gear to increase the rate of fire at a cost of increased manning. After dual turret on USS Georgia B-15. The lower pair guns are 12"/40 (30.5 cm) and the upper pair are 8"/45 (20.3 cm). During gunnery drills off Cape Cod on 15 July 1907, ten officers and men were killed and another eleven injured when a powder charge ignited prematurely on the 8" (20.3 cm) level of this turret. U.S. Naval Historical Center Photograph # NH 101469. Forward 8"/45 (20.3 cm) turret of USS Pittsburgh. CA-4 (ex-USS Pennsylvania ACR-4) in 1930. U.S. Naval Historical Center Photograph # NH 71964. Breech of 8" (20.3 cm) gun believed to have been aboard USS Rhode Island B-17. Note the hand crank for working the breech mechanism. 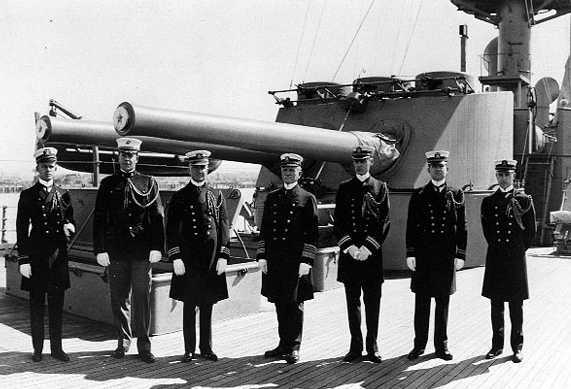 This was a complicated, slow working mechanism, which is why some US predreadnoughts also carried the more rapid-firing 7" (17.8 cm) guns as their secondary armament. U.S. Naval Historical Center Photograph # NH 101086. 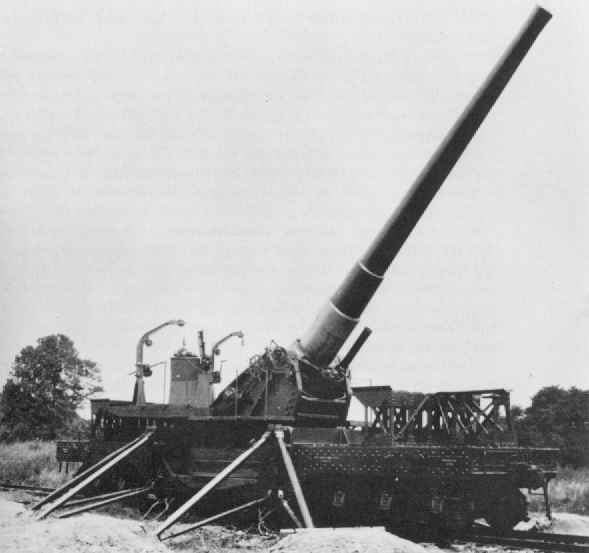 Naval 8"/45 (20.3 cm) gun on US Army Railroad carriage in 1938. U.S. Army Ordnance Department Photograph. Sketch of Army 8" (20.3 cm) Rail Road Mountings M1A1.